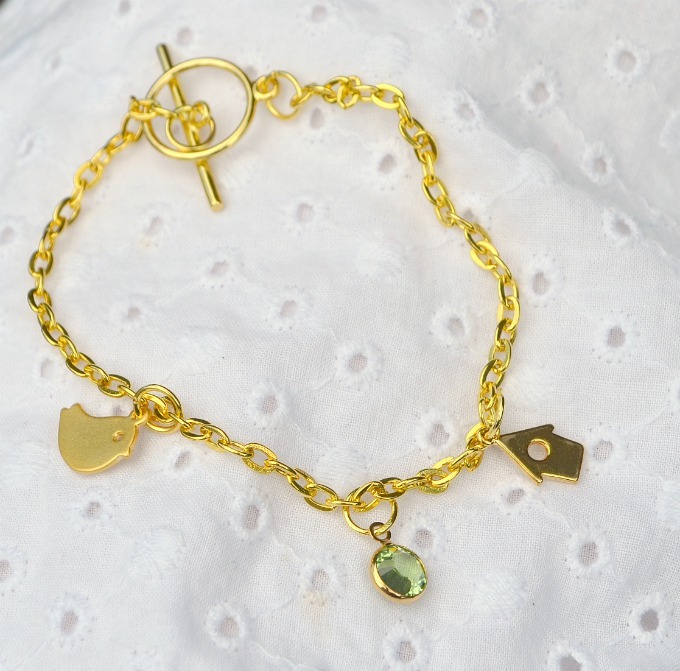 You are here: Home / Uncategorized / Little Bird Charm Bracelet & a Target Gift Card Giveaway! Little Bird Charm Bracelet & a Target Gift Card Giveaway! If you’ve never made jewelry before, this is a great first project because there are no fancy skills required. It helps to have a few basic tools, but if you don’t, you can borrow a pair of wire cutters and pliers from the hubby and you’re good to go. Step 1: Measure your wrist and cut your chain accordingly. Make sure to account for the fact that the toggle clasp will take up a bit of space. Step 2: Attach a jump ring to each of your charms. Space them out evenly around your bracelet and close the jump rings. Tip: When opening jump rings, always twist them rather than pulling the ends apart. Then, simply twist them back in place. This will make them close more securely. *Note*: I only have one child, so I just had the bird, the bird house and one birthstone. For multiple children, you can personalize with as many birthstones as you like. I suggest folding your chain in half to find the approximate center and attaching a charm there. Then count a certain number of links to the left and attach the next one. Count the same number to the right and attach the third, and so on so they are evenly spaced. I had seven links between my charms. Step 3: Attach a jump ring to each end of the toggle clasp and secure to the ends of your chain. It’s super easy to do even if it’s the first time you’ve made your own jewelry! And I just love that you can make it totally personalized to represent your own family. This also makes a great gift for moms, grandmas, aunts…anyone! What would yours look like? Five of #myfavoritebloggers also have really fabulous bird-themed projects of their own to share with you today too; be sure to check them out and of course to enter our $60 Target e-gift card giveaway! Now, on to the giveaway! This month’s giveaway is for one $70 Target e-gift card. Giveaway is open from 7/17/14-7/24/14. Twitter is in no way affiliated with this giveaway. Only valid entries accepted. Winner will be contacted via email and will have 48 hours to reply and claim their prize. Good luck! Rafflecopter will walk you through the entry process. Thanks for sharing the lovely crafts and for the opportunity to win! So cute, Amy! I love the bird and house charms paired together!